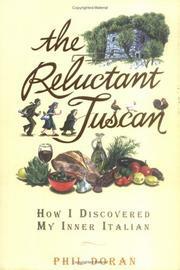 He gave up television for a home in Tuscany, and he grouses about it? Yes, writer-producer Doran’s comic transplanting from Los Angeles to rural Italy initially wrenched at the moorings of his wayward self-esteem, though it eventually cut him a new and better course. After 25 years, the successful sitcom veteran found himself struggling against the next wave, the young guys who were washing the old ones into the sea of unemployment. Fortunately, his wife was arranging a new life for them in Italy, where she had purchased a 250-year-old stone farmhouse atop a hill of olive trees outside the town of Combione. Will this be another self-congratulatory memoir of a well-off couple moving into the silvery haze of a midlife rejuvenation along the Mediterranean, throwing brickbats and dollars at the foibles of the locals? Thankfully, no. Doran is a deeply neurotic character, a man subject to anxiety attacks and facial tics when things go against him. It took him months to know a good thing when it bit his ankle. The stress of moving house, the troublesome brood living next door, the zealous bureaucratic confrontations, and the standard delays in getting anything done all drove him into a state of collapse. But he also came to realize that he had fed at the trough of Hollywood long enough and lived in his own skull too many years. His narrow band of emotions would be better served by a scream or a loud laugh, Doran concluded. He vented his “inner Italian,” the part that craved to savor life at full throttle, to e-mail his agent to stick it, to get married again (to the same woman). Sure, he sometimes broke into a sweat but he also slipped into a new life without the advantage of pharmo-chemicals. Bets are that Doran spends more time in Italy now than he does in California.